or complicated layer wedding cakes in these versatile, durable baking pans! ‍ Mess Free Kitchen for a Happy Mom and Dad! Sometimes your budding bakers love to get involved and "help out" in the kitchen. They may be great at following a recipe, but cleanup is something else. Disposable baking tins will make your life that bit easier as you can just throw out the dish once everyone's finished eating.  Unleash Your Creativity in the Kitchen with a Bulk Pack of Baking Pans! If you have always wanted to make a 5-layer wedding cake but could never bring yourself to buy that many baking pans. You can now create awesome layer cakes using multiple baking pans in the oven at one time. Enjoy making colorful rainbow batters and baking each color in the square tins. The nonstick surface means that they slip easily out of the pan.  Durable Design to Give You Peace of Mind! If you've experience drips and spills in your oven and are fed up of scrubbing away at stuck on food. These baking pans measure 3/4" inch deep which means that batters and gravy won't be sloshing all over your oven. They are deep enough to perfectly cook lasagnas, quiches and even casseroles and pot pies in. ↕ Width - 11 1/4"
Tip: Use silver foil or buy some lids to fit these square pans and use them to transport food or as food storage containers. 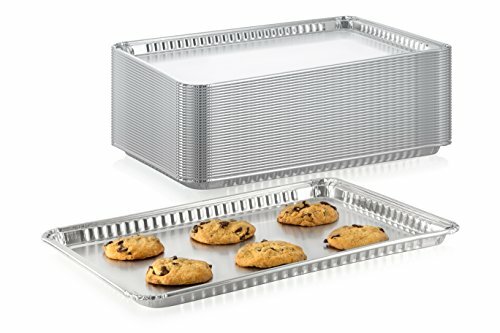  VALUE PACK OF 15 BAKING TINS - The flat baking pans bulk pack will save you lots of money and trips to the grocery store every time you run out of foil baking pans. These 16" x 11-¼ inch baking pans will last you a long time. If you have any issue with your pack of cooking pans simply contact us so we can resolve your questions as quickly as possible.  DURABLE FOIL BAKING & COOKING PAN TRAYS - These durable cook pans are sturdy and safe to ensure no leaks or spills in your oven. Pour in your cake batters or layer cheesy lasagnas without worrying about flimsy cake pans or shallow dishes. The square tin has been made with extra-thick food-grade aluminum and have conveniently high 1.75" sides.  PERFECT FOR BAKING WITHOUT THE MESS - Uggh we all hate washing out baking tins or pans when we've finished cooking. This disposable square baking pan will let you enjoy cooking and baking without the stress of cleaning up, simply throw out when you're done. You can have your cake and eat it too! Cook and serve from the same dish! No more multiple dishes, baking tins, and platters to wash up after every meal.  SUPERIOR HEAT CONDUCTIVITY FOR EVEN COOKING AND BAKING - The superior heat conductivity of these foil baking pans will ensure that all your food cooks evenly all the way through. No more dry edges and raw cake centers, your entire cake will be fluffy and moist. If you are cooking other things like lasagna, quiches or scallop potatoes they will also cook to perfection in the aluminum baking tins.  SQUARE DRIP PANS FOR ANY TYPE OF FOOD - the square baking pan is the perfect baking dish for all kinds of cakes and food. Use for brownies, layer cakes or checkerboard cakes, you can even use multiple baking pans to make cake layers for rainbow cakes or wedding cakes. They are also good as storage containers for leftovers like rice, vegetable, pasta, meat or chicken. If you have any questions about this product by DCS Deals, contact us by completing and submitting the form below. If you are looking for a specif part number, please include it with your message.